The Afghan Women’s Mission was founded in January 2000 by a small group of Americans to support the humanitarian and political work of RAWA. Projects include many programs run by Afghan women including Malalai Clinic, schools, orphanages, agricultural programs, demonstrations and functions in support of women’s and human rights. We are an all-volunteer organization based in the United States. The Afghan Women’s Mission was founded in response to the compelling need for adequate hospital facilities near Afghan refugee camps in Pakistan. Our first undertaking was the re-opening of the Malalai Hospital in Rawalpindi, Pakistan. This flagship project was effectively started in late 2001. In 2005, Malalai Hospital was transitioned into Malalai Clinic in Khewa refugee camp. 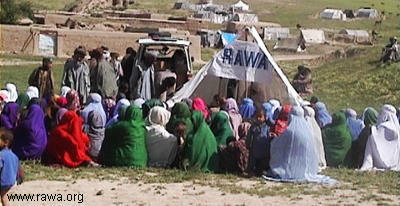 Health Care: establish and operate free health centers serving primarily Afghan women and children. Education and Empowerment: support schools and other programs for Afghan refugees to alleviate emotional suffering and decrease illiteracy and joblessness; and to empower Afghan women to build sustainable livelihoods. Awareness: conduct campaigns to increase public awareness on women’s and human rights and related issues in Afghanistan and Afghan refugee camps. Sonali is host and co-producer of a one hour daily radio show called Uprising on KPFK (90.7 fm in Los Angeles and 98.7 fm in Santa Barbara), a listener-sponsored community radio station, which is part of the Pacifica network. Sonali’s radio show airs from 8 am to 9 am weekdays and is a public affairs political news magazine. Sonali is also a spokesperson for the Afghan Women’s Mission and speaks widely on college campuses, community fora, and conferences. She is also the co-author with James Ingalls of Bleeding Afghanistan: Washington, Warlords, and the Propaganda of Silence (Seven Stories 2006). Sonali is AWM’s spokesperson and event organizer. She also manages AWM’s website and mailing list. Jim is a staff scientist at Caltech’s Spitzer Space Telescope Science Center. He manages AWM’s monthly pledge program and website. Jim has written on a number of political issues and been interviewed widely on Afghanistan and other topics. He is also the co-author with Sonali Kolhatkar of Bleeding Afghanistan: Washington, Warlords, and the Propaganda of Silence (Seven Stories 2006).